The event also honoured its former leadership – Drs. John Day, John Last, Luciano Neri, Bob Spasoff, Ian McDowell, Rama Nair, George Wells, Julian Little and Doug Coyle. 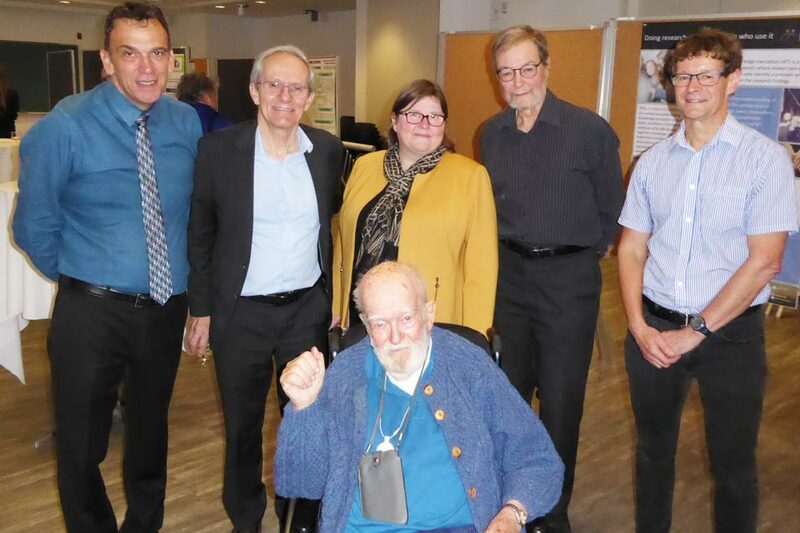 On Friday, October 19, the School of Epidemiology and Public Health (SEPH) at the Faculty of Medicine celebrated its 50th anniversary from when it was first created as the Department of Epidemiology and Community Medicine. With remarks by the Dean, Dr. Bernard Jasmin, and the School’s Chair Dr. Melissa Brouwers, the celebration at 850 Peter Morand was open to all members of the Faculty community and included a highlight of SEPH’s transformation and milestones over the years. The event also honoured its former leadership – Drs. John Day, John Last, Luciano Neri, Bob Spasoff, Ian McDowell, Rama Nair, George Wells, Julian Little and Doug Coyle. The co-hosts, Drs. 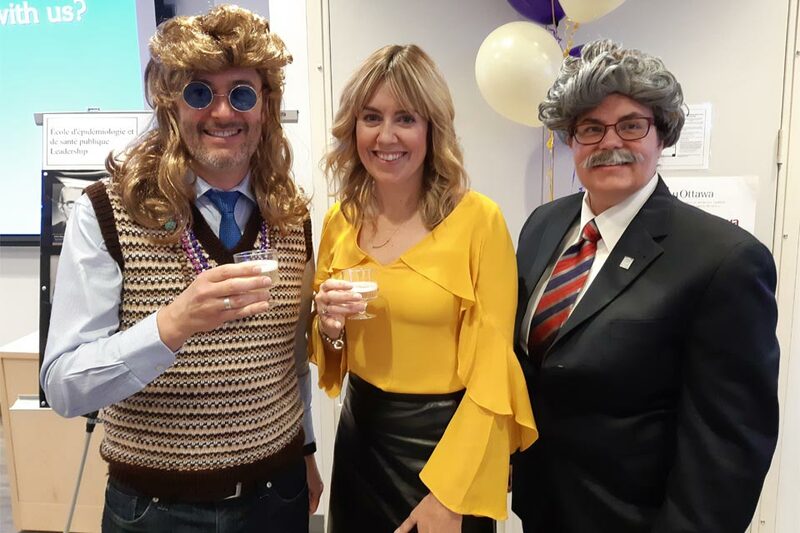 Monique Potvin-Kent and Ian Colman, kept the spirit of the late 1960s in the minds of the guests who were entertained by a faculty/staff talent show and a Jeopardy Fun Facts game hosted by SEPH’s very own Alex Trebek (aka Jennifer Collins). The School is interdisciplinary and conducts research into the various factors that determine health and disease in humans, as well as provides training for health researchers locally and internationally. Its faculty members offer advice and support to people and agencies who seek knowledge and expertise in epidemiology and public health. Over the years, SEPH has developed strong links with clinical epidemiology and public health research programs via its collaborations with various research institutes and agencies affiliated with the University of Ottawa. Important research and training continues to be conducted in partnership with organizations, such as OHRI, CHEO, Bruyère, Royal Ottawa, Ottawa Public Health, Public Health Agency of Canada, Canadian Agency for Drugs and Technologies in Health, Health Canada and the Champlain Local Health Integration Network. With more than 200 affiliated faculty members and over 165 trainees, the School produces a large number of research outcomes that contribute to a highly active learning environment. The interdisciplinary nature of the School and its ability to develop community partnerships have enabled it to achieve a high level of research intensity. The last 50 years saw so much accomplished and the School looks forward to what it will achieve in the future. From left to right: Drs. Doug Coyle, George Wells, Melissa Brouwers, Bob Spasoff, Julian Little and John Last. From left to right: Ian Colman, Monique Potvin Kent and Jennifer Collins.